Last night I met John. 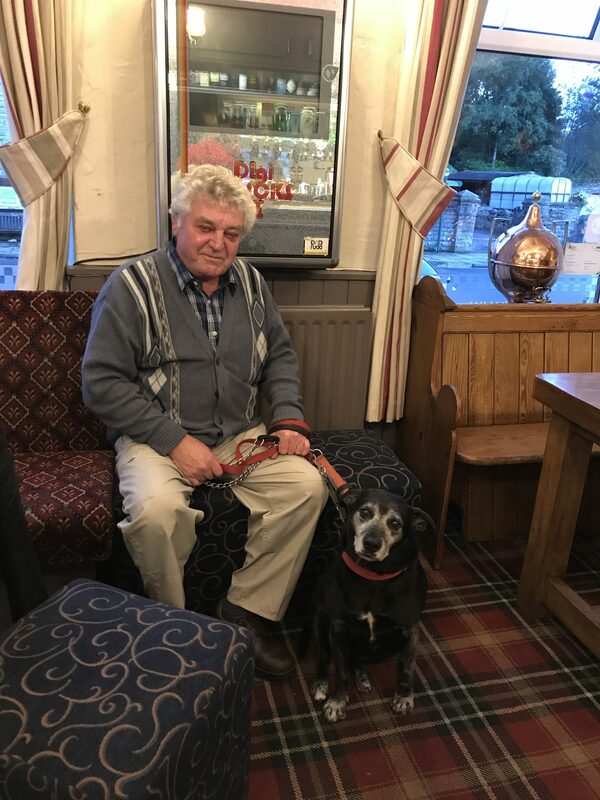 I was sitting in a pub in Hawes, tapping away at my blog and John sat beside me with his dog, Penny. He told me how Penny had given him the confidence to carry on going away in his caravan, following the death of his wife three years previously. John is one of the reasons I love adventure. He was charming and interesting to talk to. We sat for over an hour chatting about our travels and lives. He insisted on buying me a drink and I looked after Penny while he went to locate his lost umbrella. When I talk about wanting to meet other adventurous people, John might not be someone who springs to mind. But he fits the bill exactly. Instead of selling his caravan and staying home he braved it and still travels around the country. Today I ride from Hawes to the far side of Leeds. My best friend lives just outside Leeds city centre and I am looking forward to staying with her tonight. Looking at the ride profile for the day, I can see that I will be starting off on a huge climb. Within half a mile or so the hill looms into view. This is Fleet Moss, a bit of a beast. It is not raining at the bottom but I can see I will be climbing into a cloud. Teeth gritted, I begin to move slowly upwards. The climb seems to ramp and ramp in its gradient. There are few cars on the road and a hare lopes along the road ahead of me. I begin to zig-zag across the road to take a little of the gradient out. My legs are sore form the previous two days and the panniers no lighter. I give in and stop to rest. Stopping means getting started again. This can only be done by going across the road to get the legs moving before pointing the bike upwards once more. After what seems like an eternity, I reach the top of the hill. I am in the cloud now and it is raining. I hear the fighter jets, practising manoeuvres, close by but cannot see them through the cloud. Visibility is low and it feels intimidating to be able to see so little around me. I scrabble in my bags for lights, not wanting to be caught out by the few cars which pass this way. Switching them on, I start my long descent. My ungloved hands freeze as the cold air rips past and I’m glad of my rain-legs, keeping my thighs from getting cold. I pass through tiny settlements; each comprising no more than a handful of stone cottages. The roads are wet once more and I cautiously negotiate tight bends. The weight on the back of the bike threatening to take it from under me. Reaching the bottom of the descent I enter Kettlewell and stop for cola and a teacake at the Cottage Tea Room. The owner of the tea shop does not seem to mind my soggy state and offers to refill my water bottles as I leave. As the day winds on the weather clears up and I am treated to a few glimpses of the sun. I sweep past the beautiful ruins of Bolton Abbey and start to see many a road cyclist. Unusually, I have not seen many cyclists for the first couple of days. It is good to be able to practise my tiny ‘I’m acknowledging you as a fellow cyclist’ nod. For a period I am almost travelling on flat ground. This feels like a revelation and far too easy. A wasp spots that I am having far too much fun and decides to take action. Before I notice it has landed on my leg I feel the sharp pain of its sting. Swearing loudly I bat it off but it has done its work. I refuse to stop and just keep on pedalling, glaring angrily down at the swelling and reddening patch. My theory that if you ignore pain it will go away is, once again, proved wrong. I know I am getting closer to tonight’s destination as I leave quiet roads and head into built up areas. The route I plotted prevents me from going through any major towns but this is certainly a change in scenery. Passing through Ilkley, then Otley, I discover my first route mistake. I am heading down a private road and a gate stops passage. Instead I have to divert onto a bridlepath; my first off-road riding of the trip. Skirting around Leeds, I catch glimpses of the city on every climb. With fifteen miles to go, I stop for a sandwich and cola before my final push. It had all been going so smoothly! In order to cut a few miles from the route, I deliberately chose a cycle track when mapping. This cycle track turns out to be a muddy, rocky, litter strewn path which emerges, first into a meadow and then a housing estate. Certainly different from the scenery I left this morning. Soon, however, I spot the modern houses I recognise. I have arrived at my best friends house and she has a can of smoked porter waiting in the fridge! A stroll with her children, to find a geocache and a big chippy tea, rounds off a fantastic third day in the saddle. 67 miles and over 5000ft of ascent have left my legs aching and sore but I am ready for tomorrow’s challenge!